I have initiated a new position in VFC in October. I also added a sizable chunk to O. The largest holdings as of now are MO, JNJ, PM, O, V, and PEP. All of these are highly defensive with the exception of Visa (I am not sure how Visa will behave during a downturn since it doesn't have a history extending that far back, but since I consider it a financial sector stock I consider it more cyclical). 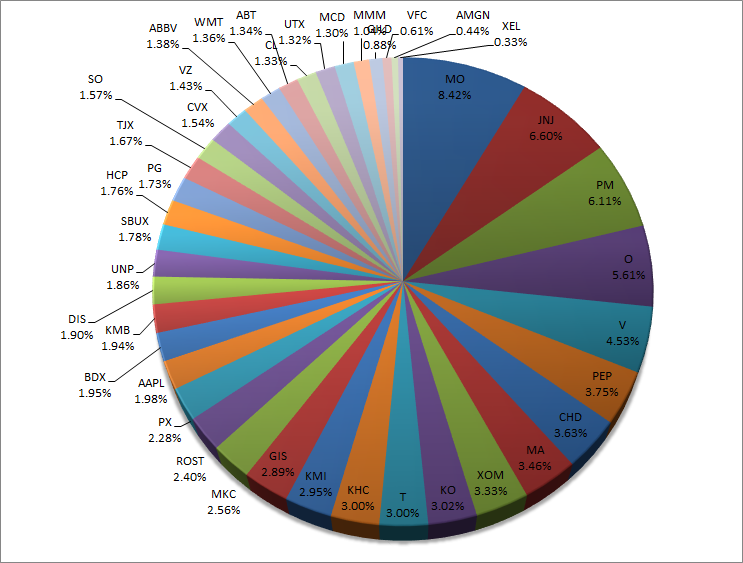 My holdings are weighted heavily towards defensive sectors. Staples and Healthcare take up nearly 50% of my portfolio. 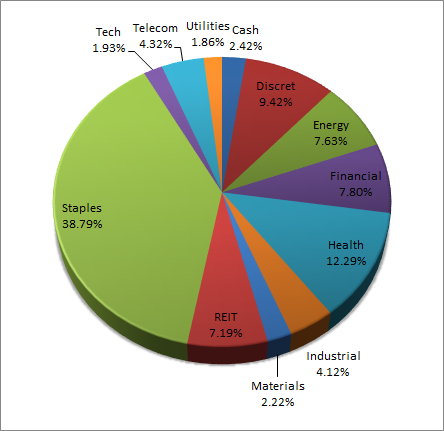 I want to some day make Utilities my 3rd largest sector. I like to call this my holy trinity: Staples + Healthcare + Utilities. Since the 2015 year is ending soon (oh how quickly has it been!) I am considering tax loss harvesting candidates in my stock portfolios. The stocks to remove and the stocks to add have not been considered yet, but I would like to get the larger tax return in 2016. This month is Turkey holiday month. Happy investing. Stay tuned. At least you got to put some capital to work this month. Unfortunately I was on the sidelines yet again although hopefully November will treat me better. Cash flow is much more stable now so I think I should be able to squeeze in a purchase. I wish staples and healthcare were my two largest sectors but I wasn't focused on them when I should have been so now I'm looking for selective opportunities. Real opportunities to add serious capital will probably have to wait for a real bear market or recession. Regarding Visa. I don't think you'll see too much of a blip whenever the next recession hits as long as the business model remains how it is. They don't provide the credit so they aren't exposed to the credit risk from credit cards. Also they get a percent off the top of each purchase so they have automatic price increases via inflation. Higher $ swipes leads to higher revenue for V. Plus there's the massive growth still from the international segments of their operations. And more and more people are switching to cards for more of their payments which is right up Visa's alley. I'd be more concerned about regulators trying to limit swipe fees or other potential payment processors such as Square, although Square isn't a big concern to me at this time. Just my $0.02. Yes I do like Visa's "toll road" like operation. You pay to use their network. The people who lend the actual money are the banks and institutions. That is why I like V's business model so much. Very little debt, very high margin, super large cash flow. My only concern is with Visa's high valuation. When the market turns south the high fliers usually get a hair cut too even though their fundamentals are still intact. I am in the process of accumulating my emergency fund. The recent market valuations make it hard for me to find things to buy. Yeah I wouldn't be buying shares just yet because of the valuation although I really want to add to my position. Absolutely wonderful company and one of the best bets to be a long term winner. Most likely I'll be waiting for a general market malaise or the next recession/bear market to be able to add shares at a reasonable valuation. 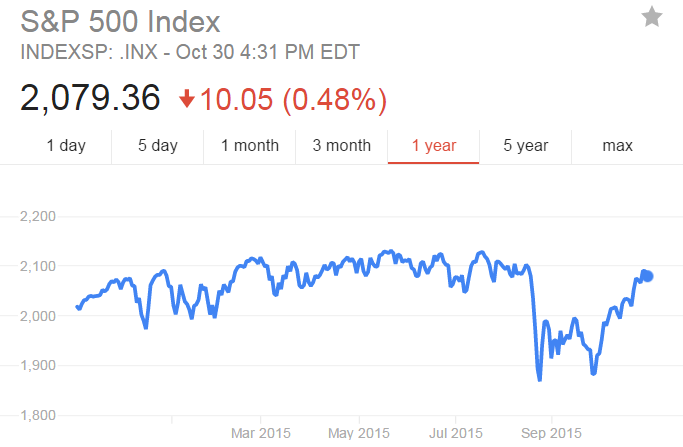 Although the late August flash crash provided a great opportunity so something might come up. You just never know.